Want to acquire more customers? Want to impress your existing customers; answer their questions rapidly on their mobile devices; solve problems quickly and not shuttle them back and forth and thus wow them with your customer service? 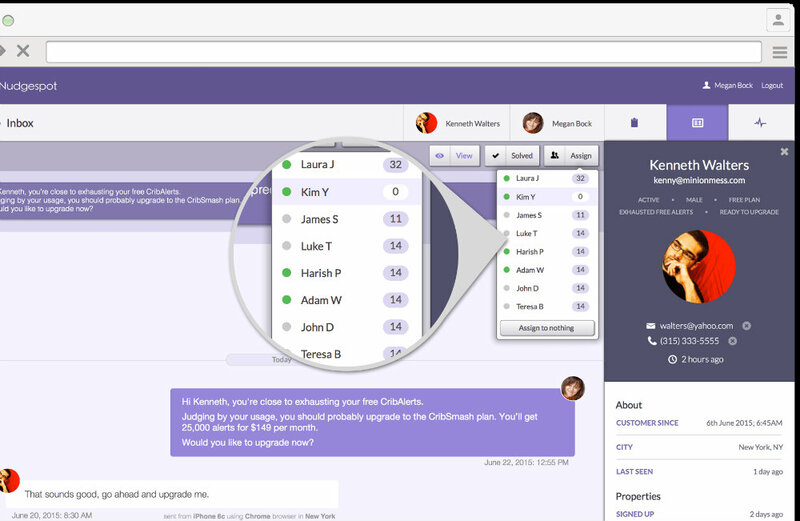 Want to add team members to conversations so that no one needs to leave or wait unnecessarily? You might be surprised to learn that you don’t need multiple applications to handle the variety of tasks mentioned above. It is possible to engage and help your visitors wherever dialogue is needed, and to ensure that you’re communicating as effectively as possible. Nudgespot Messenger is messaging app that empowers businesses to communicate with visitors on their websites and mobile apps. With Nudgespot, businesses can chat and send messages in-app, giving both potential and existing customers the attention that they deserve. Not only can businesses reach out to visitors in the moment (and build lasting relationships with them), they can build a history of interactions that allows them to make conversations more personal over time. We all like that feeling of being treated like a valued regular – and Nudgespot makes it possible to create those good feels, despite the difficulty of doing so online. Nudgespot also tracks what features customers are and are not using, so that sites can be improved accordingly. In addition to real-time messaging with users, Nudgespot allows team members to collaborate and address issues more speedily. Additional team members can join conversations and send notifications or tagged messages along as needed. Basically, they can tackle customer issues without delay. Nudgespot also enables businesses to send triggered messages and reach customers via email or mobile messaging. A shared inbox allows teams to monitor activity and assign tasks as well as easily search and manage conversations. If you want to live chat with your customers and show them just how much you care, Nudgespot is a powerful tool for communication. Faster, more personal, available on any device – learn more about how your customer service and marketing teams can power up the way they talk to customers by visiting nudgespot.com.